At the risk of sounding alarmist, I want to alarm you all. I am currently rereading Under The Skin for about the sixth time, and I noticed today from tube adverts that the film adaptation is out March 14 or 15. Now, I utterly hate it when things are oversold to me, but if you ever want to experience this novel - which is among the most extraordinary I've ever read - in the manner in which it was intended, I beseech you to read it within the next 4-6 days, before the hype machine amps up and partially spoils it for you. I may have spent a portion of this afternoon drinking 15% beer, but I assure you, you should not allow Hollywood to ruin this for you. See, I’m not normally the one to go out and buy a book right after someone’s recommend it to me. Usually I just add it to my never-ending to-read list where it sits waiting to be chosen like a puppy in a dog shelter. 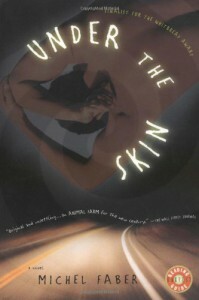 But then, Craig is not normally given to being dramatic, so I thought maybe I should heed his warning and to my amazement I dropped everything I was reading, went and downloaded ‘Under the Skin’ and started reading it right away. Craig was right, ladies and gentlemen. Now all I want to do is tell you nothing about this book but somehow convince you to read it. Maybe I will say that it’s about a woman who drives around Scottish frontiers and picks up hunky hitch-hikers. The opening might be erotically charged but the irony of it will hit you later. It’s a book that asks the readers for their definition of what it means to be human and then forces them to take sides. Nothing new here but presented in a such mind-bending way that we just have to admit that our claim to evolutionary superiority is very weak. Our arguments are arbitrary and self-serving. We’re all animals. While including as few graphic details as possible, it manages to be one of the most disturbing things I have ever read. At some point I really wanted not to want to read it anymore. I think the greatest twisted strength of this book was that it made me form alliances with the characters before I knew the whole story, or at least all the sides to the story. Once all is revealed, you can’t get out of it without exposing yourself as a hypocrite. And yet, in all of this, there is somehow room left for gentle emotions, melancholy, evocative descriptions of the landscape and a hint of a love story. The descriptions in this book are superb. You can see clearly all the characters, sense something off about some of them but at first can’t quite lay your finger on what it is. You see Isserley, the main character, through the eyes of different hitchhikers and it is quite amazing how different their impressions are but in the end they form in your head a cohesive picture of the woman. I don’t know what Scarlett Johansson is doing starring in the adaption of this book. This makes no sense whatsoever. Read the book. It might or might not be a coincidence that some time after finishing this novel I had this genius idea: hey, maybe I should try to be vegan for a while. Of course, the message of this book not subtle but somehow I had no problem with it at all. Michel Faber is currently the best thing you can find in Scotland.